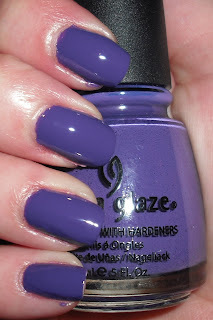 Imperfectly Painted: Finally United with China Glaze Grape Pop! See, I told you I can't stay away too long. I may be able to make posts later at night when my parents go back to their hotel. Anyways, I can't for the life of me remember what got me crazed about Grape Pop. One thing I do know is that I was that I needed it. If you followed me on Twitter a few months ago you may have seen my less than sane tweets about my dire need for Grape Pop. Isn't she lovely? Grape Pop is a blue-violet med-dark creme. I loves cremes like this that come in non-traditional colors. It's funky and different. I overall love this color!!! :) I think my love for it comes from being a kid. I always loved this shade of purple. I remember when I first started using the internet and AOL chat I always used this color font to type in. That's it for today. My parents arrived this afternoon. We went out to lunch and did some shopping. We went to Big Lots which was a HUGE disappointment they had little to no makeup there. I ended up getting one Wet N Wild polish. We then went to this store Aldi it's a very odd type of grocery store. It's kind of like Costco or Sams but 1/3rd of the size. They had their own brand of make up there. They had nail polish but only 5 standard colors. I ended up getting 2 because they were cheap and I wanted to try them out. You'll be seeing that stuff in the future! There is something about this purple, its so pretty and different in a way :) Curious to the 'cheapass polishes' you talked about haha. I've been lemming this for awhile, I totally need to get it; it looks great! LMAO! I totally forgot you were lemming that big time. I remember when you were going through lacquers looking for dupes and never feeling satisfied. Its like craving a piece of chocolate cake with chocolate cream cheese frosting....going to get a snack wells devilsfood cookie will not cut it. I'm glad you got your real chocolate cake with chocolate cream cheese frosting (I'm totally making myself hungry, lol). And I'm glad your having a fabulous time with your parents. I'm glad your thirst for Grape Pop has been quenched! Aldi is a European chain of supermarkets (German, I'm pretty sure, but I forget). We have quite a lot of them in Oz. Why aren't your parents staying with you? They don't want to be a burden? Lol. i just ordered this yesterday, and am DYING for it to come!!!! Great color, it's still on my list as well. I can understand you wanted it badly!